Another week passed by, and I found something interesting to share with you All. I was strolling up-down on the High Street not far from my place and I thought I’ll try something different and eat Japanese for a change. Let me tell you all about Mochi! 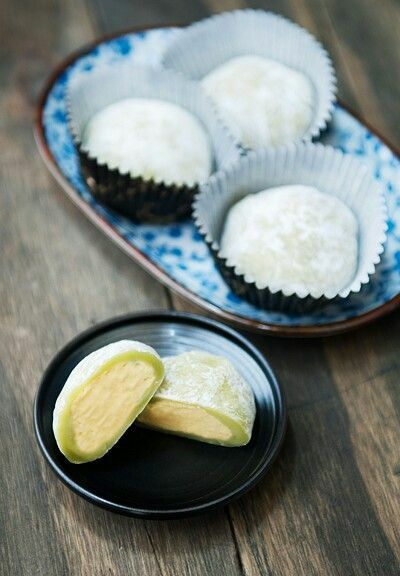 Mochi is Japanese rice cake , made of a short-grain japonica glutinous rice. The rice is pounded into paste and molded into the desired shape. In Japan it is traditionally made in a ceremony called mochitsuki. Mochi is a multicomponent food consisting of polysaccharides, lipids, protein and water. Mochi has a heterogeneous structure of amylopectin gel, starch grains and air bubbles.This rice is characterized by its lack of amylose in starch and is derived from short or medium japonica rices. The protein concentration of the rice is a bit higher than normal short-grain rice and the two also differ in amylose content. In mochi rice, the amylose content is negligible which results in the soft gel consistency of mochi. 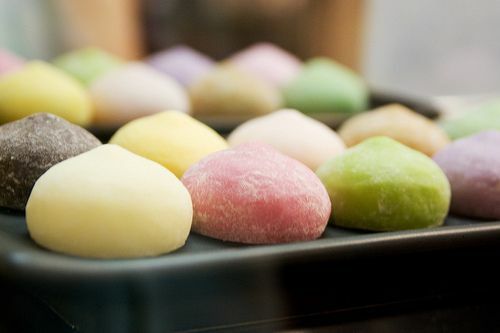 Traditionally, mochi was made from whole rice, in a labor-intensive process. Polished glutinous rice is soaked overnight and cooked. The cooked rice is pounded with wooden mallets (kine) in a traditional mortar (called usu).Two people will alternate the work, one pounding and the other turning and wetting the mochi. They must keep a steady rhythm or they may accidentally injure one another with the heavy kine. The sticky mass is then formed into various shapes. Mochi can also be prepared from a flour of sweet rice (mochiko). The flour is mixed with water to a sticky opaque white mass that is cooked on the stove-top or in the microwave until it becomes elastic and slightly transparent. Many types of traditional wagashi and mochigashi (Japanese traditional sweets) are made with mochi. For example, daifuku is a soft round mochi stuffed with sweet filling, such as sweetened red bean paste (an) or white bean paste (shiro an). 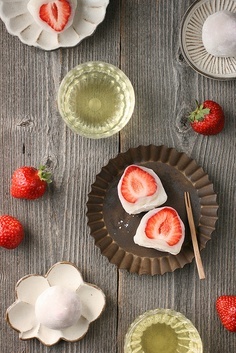 Ichigo daifuku is a version containing a whole strawberry inside. 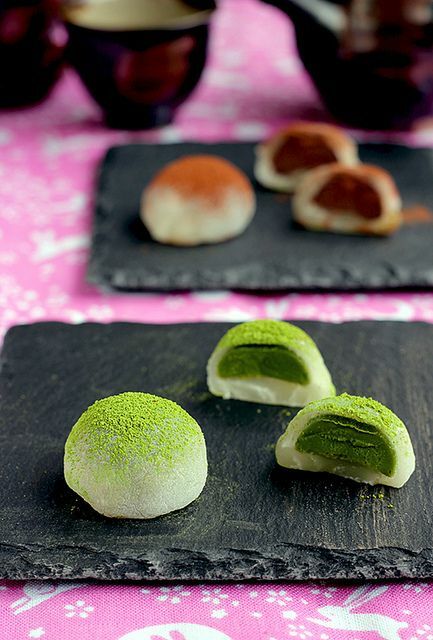 Kusa mochi is a green variety of mochi flavored with yomogi (mugwort). When daifuku is made with kusa mochi, it is called yomogi daifuku. Mochi not only used for cakes , it can be also made into an ice cream and soup as well. I hope you enjoyed your meeting with my old friend Mochi.